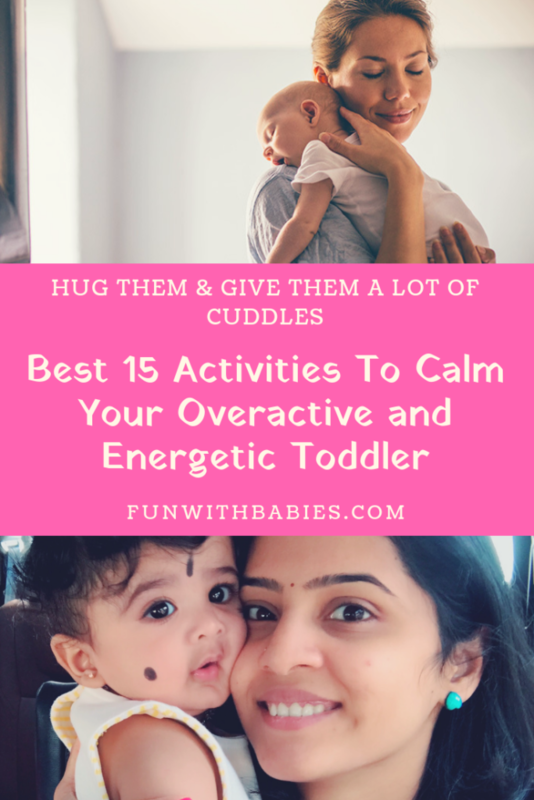 All the mothers who have toddlers know how energetic they can be. 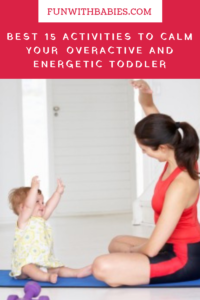 Toddlers tend to be overactive. This might be because they are exploring the world around them. They want to do everything you do, try everything you do. When the kids cannot handle their own energy they become agitated. Sometimes these energetic toddlers can become so hyper energetic that they cannot channel it into a constructive play. They might start getting anxious. They will be interested in throwing stuff etc are some behaviors that they are unable to handle the energy burst in them. In such cases you as parents have to take an initiative to calm your child. You know your child the best, so you are the best person to know what to do to calm them down. You should begin unwinding them as soon as possible. 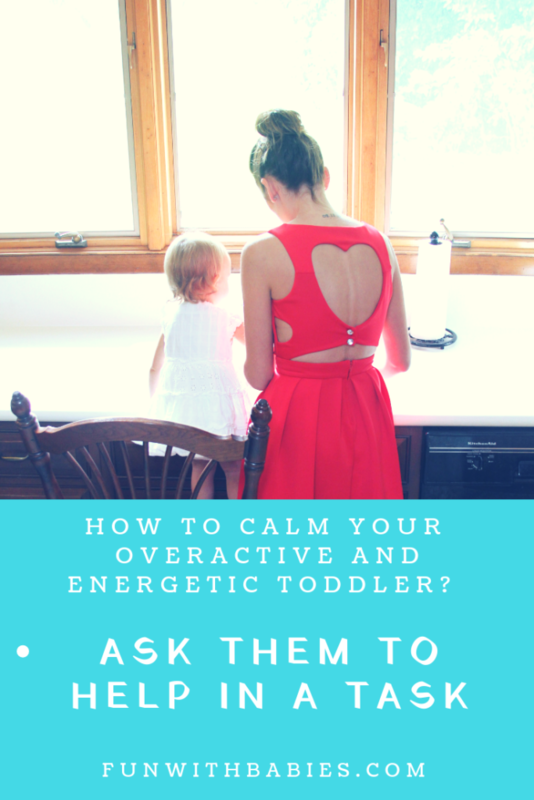 If you have a confusion regarding how to calm your energetic toddler, then let me clear it a little for you. 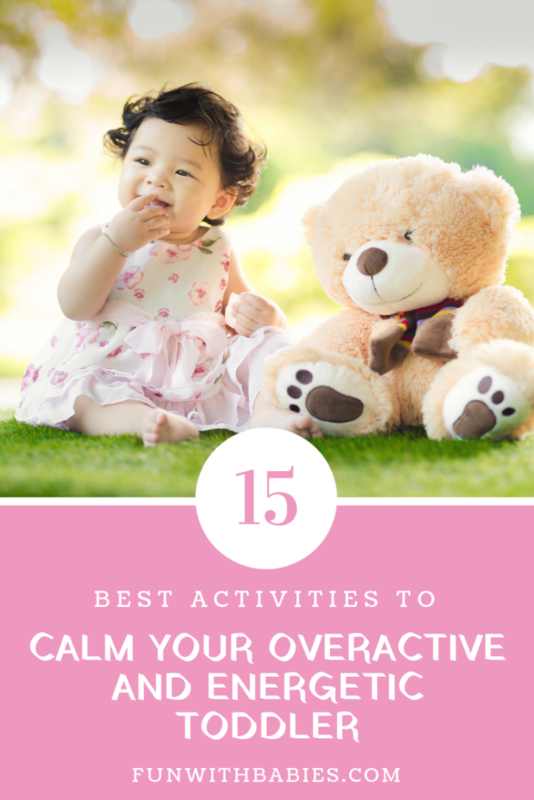 After reading this you can come up with your own versions of activities that might calm your little one. Show your little one all the love you have for him in hugs and cuddles. Hugging and cuddling are best relaxation idea for your little one when he is unable to understand his emotions or hurt in any way. Suppose in case were your baby does not want to hug or cuddle, get into tickle fights. This is bound to calm them and distract their mind. Also another great idea is pillow fights. The best for overactive and energetic toddler. Who does not love a pillow fight right? Pillow fights will help them let out their emotions and energy into it. This will help them calm down and may even feel better afterwards. My little one loves pillow fights and tickle fights. Every child loves music. You just need to find the right one to calm them down. May be you can put on a soft and soothing music and sway a little while holding your toddler. Nothing calms them like a slow and silent dance in your arms listening to your heartbeat and matching theirs to yours. Comparatively if your tot does not like silent and soothing music, you can go for whatever he/she likes and dance it out with them. By the time the dance ends they might be tired or moreover over the thing that caused them to become so hyperactive. Toddlers love story-telling. I have not seen one toddler who does not like story time. Make it fun. Use high pitched voices and animated voices and expressions. Involve them in the story. Make up stories with their names given to the heroes or characters of the story. This helps them calm down and may be if your tot is imaginative enough he might tell you a story of his own. Food calms down many toddlers I know. Not only toddler food calms down a few adults I have met. When you toddler is highly energetic, give him a bowl of finger foods. May be cooked vegetables or rice or any healthy option the toddler likes. Letting them eat on their own gives them a chance at concentrating on eating food rather than spending that surge of energy. Also you can give them a water in a cup or sippy cup. Massaging is the best stress reliever for you and your baby. Massage your baby and let the baby muscles relax. While massaging you can help them with a few exercises that calms their mind down. After the massage have a warm bath ready for your baby. The warm water soothes the baby’s body releasing some tension (stress) from their body. Generally playing with water or sand is said to calm the babies down from their normal energetic behavior. My little one in one of the hyperactive toddlers. His pediatrician suggested sand play and water play twice or thrice a week to keep him calm. The main reason to do this is to keep them from getting frustrated or irritated. You can take your little one to parks where they have sand. Water play can be done at home only in some bath tubs or you get those inflatable water tubs now a days. Clay play is also a good idea. They can shape their ideas and they will use the budding creativity in themselves. Some might even tend to just squeeze the clay and it helps them calm. Whatever they do appreciate things they have done. This will motivate them to focus on creating something rather than destroying something. Surprisingly cooking or baking helps kids calm down. Toddlers love to play in kitchen utensils. They love the sound it makes, the smell cooking exhibits. Toddlers love to see what you are doing and they love the fact that you are letting them see what you do. Adding to this you can even ask them to help you with small things like giving you a particular ingredient, stirring something. A parent or caregiver is present during this activity. They should not be unattended as it can be dangerous. You can teach them simple meditation. Meditation need not be intense meditation for toddlers. You can just simply lie down with them and ask them to imagine a calm place or imagine something that makes them happy and keep thinking about that. You can just ask them to relax and count to a particular number. Meditation is very helpful in calming a toddler or a kid or and adult. It is a long process to lear to meditate. Consequently it is a very helpful experience you are providing them with to cope with all the stress and pressure in life. Do yoga with your toddlers. Trust me when I say they love anything that you do with them. Yoga helps their body and mind. You can start with simple yoga poses for kids. Yoga is very good to have a well functioning body metabolism, flexibility. None the less all this will help them in future!! ( I still thank my parents for making me go to yoga classes. Because of that I have a good body and love for exercises). Painting and scribbling are a creative way of releasing all the wound up energy you have. Painting need not be a perfect figure painting , you can do anything like finger painting, leaf painting etc. Scribbling is generally for toddlers who haven’t got the hang of painting it. Babies generally from a young age tend to start scribbling once they find a pen and a surface for scribbling ( may it be floor or walls) . I generally let my little one scribble on walls as I have covered it with big white sheets because it is said to increase their creativity. But we have set a rule of no scribbling in other’s houses. Greenery is soothing for eyes and mind of any person. When your little one is too energetic take them out for a walk. When you are walking you can help your little one observe the surrounding ( people, plants, pets or birds etc). This will shift his focus for as long as he is out. If you have pet or know someone in the neighbors who has a friendly and clean pet, take you toddler to interact and play with the pet for some time. You can let them pet the animat for some time until they calm down. Start whispering something. Trust me they will calm down and will want to listen to what you are saying. Keep talking to them in whispers for sometime so their energy is spent in listening to you. Toddlers feel that they have grown up when you ask them for some help. You can give them any small task or cleaning task or any help that you require in your task. Once they complete it appreciate them. They will ask if you need help more and they can channel their bundle of energy into the work you give them without knowing that it is a technique to calm them down. The little bundle of joys are sometimes overwhelmed by the world around them. There might be some things that they do not understand or emotions they cannot name. Playing and being energetic when they are satiated and being cranky or crying is the two way they can communicate best. But when they get stuck somewhere in between that is when you need to step in and take it into your hands to calm them down. 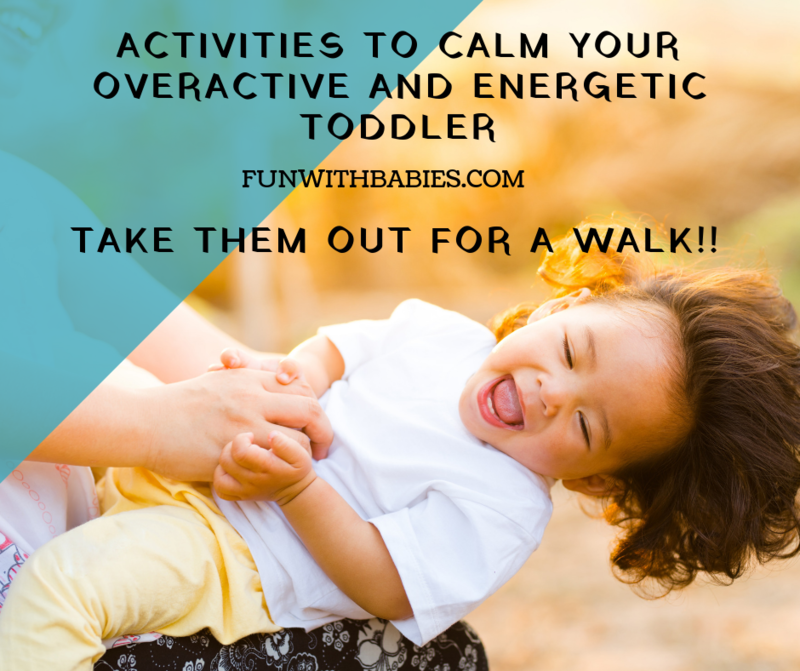 Please let us know if you have your own way of calming your overactive and energetic toddler in the comments section. Thank you for reading our article. It would only be possible to reach many parents with toddlers if you share this article to people you know!! ← How to burp a baby?